Daily Illuminator: A GURPS Thanksgiving? 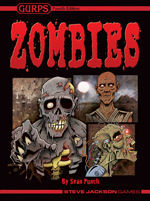 November 28, 2013: A GURPS Thanksgiving? There's no e23 release this week, so those of us who work behind the scenes on GURPS goodies have taken a few moments to reflect on the past several months. It's been an exciting year at the company (thanks in no small part to unloosing the behemoth Ogre upon the world), but one of the side effects of that excitement has been that most of our victories in GURPS planning have been behind the scenes. Still, we have many things to be thankful for, and it seems like a good time of year to remind ourselves of some of them. First, we remain amazed at the quality of contributions and discourse on the GURPS forums. I've been a reader and contributor to many RPG groups, and the GURPS forums are among the most vibrant and active while maintaining a remarkably high signal-to-noise ratio. Over the past year, we've added a whole new subforum -- GURPS Resources -- which puts the cream of the crop in one easy-to-access spot. If you're looking for some of the best threads to start exploring, check out our recommendations of blogs, campaigns, and useful files. There's certain to be something interesting, whether you're just beginning with GURPS or you're a seasoned pro. 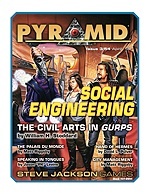 We've also been thankful for the ongoing growth and support of Pyramid, the monthly magazine that's especially tailored to GURPS. Even during the driest months for e23, Pyramid continued to come out, serving as the cutting edge of GURPS excitement with material by Sean Punch, Jason "PK" Levine, David L. Pulver, Phil Masters, Hans-Christian Vortisch, Douglas H. Cole, and many other incredible GURPS authors. Pure prideful bias compels me to say that every issue we release is the absolute best thing ever, but three particularly noteworthy installments are Pyramid #3/52: Low-Tech II, expanding on the wildly popular GURPS series; Pyramid #3/54: Social Engineering, including a meaty piece by William H. Stoddard that expands on his award-winning supplement; and Pyramid #3/55: Military Sci-Fi, with gear, tactics, and loadouts perfect for saving the Earth from chitinous critters. So to all our loyal GURPS fans, as well as the dozens of new would-be fans finding us for the first time every day: we thank you all . . . and we hope you continue to enjoy the bounty of GURPS goodness now, and for Thanksgivings to come.